Of course what he was trying to say was “Fool me once, shame on you; fool me twice, shame on me.” In effect, be wary of those who have already proved untrustworthy lest they do it again. Be vigilant. Well, the Canadian Conservative party is at it again – trying to destroy another person’s credibility, focusing their bullying (yes, bullying) against newly minted Federal Liberal leader Justin Trudeau. One part of that ad resurrects very old footage of Trudeau saying "Quebequers are better than the rest of Canada" (CTV, 10/15/1999). The attack ad states this is divisive. Just don't talk about this: Stephen Harper opening up the 2010 Calgary Stampede, where he called Calgary the "greatest city" in the country. Talk about East/West divisiveness. Airing the ad during middle-aged male programming is an important fact. Trudeau is polling as well with men as he is with women. Men are the Tories’ voting base. They’re afraid, I believe. Not only did the Tory attack ad use old and out of context quotes but also out of context imagery to try to smear how we voters feel about this man. The 2011 "striptease" was for a "win a lunch date" fundraiser for the Canadian Liver Foundation. He helped raise $1,800. For this they used their own Conservative Fund of Canada money to make and distribute that travesty against decency and Canadian values. This time it’s a bit different. They’re using our taxpayer money, and are not just attacking his abilities, but casting doubt on his masculinity. This is dangerous ground, Mr. Harper. There are laws against behaviour similar to this. I believe you have even passed some in “your” parliament, and are about to pass more. The latest missive from the "Harper Government" is what forced me to raise my voice today and speak. The newest bit of nastiness from the Conservative party is a bulk mail flyer that will be arriving in your mailbox soon. This is mailed courtesy of our MPs constituency mailing service. So we are paying for this, but it has nothing to do with government affairs. Well I believe that the majority of Canadians would disagree with you, Mr. Harper. I’ll tell you what really pisses me off. It’s the manner of the attack. I’m a designer. I know what a visual message is – and this one is bad. The flyer uses some not so subtle techniques to throw doubt on Trudeau’s manhood. The flyer is divided in two. On the left Trudeau, on the right Harper. One of the main typefaces used is a very feminine script (Honey Script to be exact). The image of Trudeau shows him a little scruffy with an open collar shirt and a jacket slung over his shoulder. He kind of looks like a sleazy guy at a bar. There is also a trail of “pixie dust” swirling down and around him. It looks very much like what Tinkerbell used to leave circling Cinderella’s castle at the opening of Disney’s Sunday night TV. Mr. Harper, on the other hand, is button down perfect, on a plain background with only what as a designer we would call “masculine” typefaces. He even has a little bit of the Peace Tower on the bottom right. Visual messaging has a long and proven record of swaying opinion, as we all know. Read the text on the left. "Drama teacher for 2 years." We all know about drama teachers, wink, wink. A record worth running on? Attack a foe’s positions? Yes. Attack a foe’s character? No. Those who attack others usually have no record of merit to stand on themselves or have things they want us to forget. That’s why they do it. Deflection is the best friend of a poor record. And our current government is in desperate need of deflection. The litany of problems associated with this government seems endless. Specifically, they are to ask permission from a liaison office that co-ordinates RCMP strategy with the office of Public Safety Minister Vic Toews. Our national police force was just politicized. The above is sadly a very partial list. It seems every day brings some other assault on our traditional Canadian values. And we have to put up with it until 2015. What can we do in the interim? Well, first don’t let this sort of virulent attack affect your opinion of Mr Trudeau or any other MP or person running for office. That’s what the Conservatives want. They did it with Stéphane Dion and Michael Ignatieff and are trying again. This time, though, I think they’ll fail. It’s obvious what they’re trying to do. They have finally achieved the transparency they campaigned on – and it isn’t pretty. For my part, when my flyer comes I’m going to mark it “return to sender.” Hopefully we’ll do the same to many Tory MPs in the next election. That mailer hurts my brain in so, so, so many ways. I couldn't agree more and will be sharing this post with others. 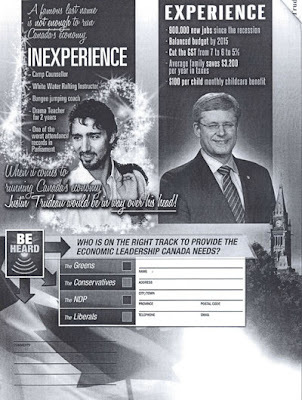 I believe this campaign will backfire on the Conservatives, big time! I have to admit I creep you for your awesome recipes lol :) A mutual friend suggested trying your bread recipe. "Yummy" Your instructions are great!! Even better the food is awesome. Anyway the reason I decided to comment today was the fact that I was bursting with the need to AGREE with what you have said. Will have to admit I was disheartened and ashamed to be Canadian when I saw the first of the ads and the hidden messages as you have pointed out. Sorry about the typos and grammatical errors when I am upset my fingers do not keep up with my thought process (Kim will explain) atleast I am not using profanity! As a Country have we not seen the adverse results of "bullying"....and our appointed representatives are nothing but overgrown, overpaid bullies. Why am I not surprised....even a Conservative MP has hung his head in shame!! !